Barr, John J.. "Ernest Manning". The Canadian Encyclopedia, 04 March 2015, Historica Canada. https://www.thecanadianencyclopedia.ca/en/article/ernest-manning. Accessed 19 April 2019. Manning grew up in a conventional Saskatchewan farm family and as a teenager was drawn to Aberhart's religious radio broadcasts. He studied with Aberhart and later became the institute's executive secretary. Ernest Charles Manning, politician, Christian layman, premier of Alberta 1943-68 (b at Carnduff, Sask 20 Sept 1908; d at Calgary, 19 Feb 1996). 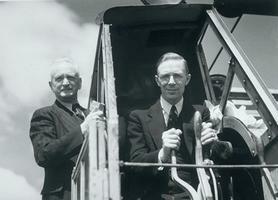 From modest beginnings as a student at William ABERHART's Prophetic Bible Institute in Calgary, Manning eventually became premier of Alberta and one of Canada's most effective provincial leaders. He was re-elected 7 consecutive times and retired in 1968 at the peak of his power. Manning grew up in a conventional Saskatchewan farm family and as a teenager was drawn to Aberhart's religious radio broadcasts. He studied with Aberhart and later became the institute's executive secretary. He joined Aberhart's Cabinet as provincial secretary, but his role in policy making was initially limited by a bout of tuberculosis. Nevertheless, he enjoyed Aberhart's confidence, and when Aberhart died from liver disease in 1943 Manning was chosen leader of the SOCIAL CREDIT Party and premier. His first challenge was the wartime popularity of the CO-OPERATIVE COMMONWEALTH FEDERATION; in the 1944 election he opposed the CCF's demand for nationalization of private utilities and won handily. Manning's stewardship of Alberta affairs for the next 25 years was marked by cautious financial conservatism and cautious social reformism. After the discovery of the giant LEDUC oil field in 1947, the government saw the promise of rich revenues to finance &QUOT;good government&QUOT;; successful oil policies attracted capital and maximized oil exploration and development. The industry grew rapidly, provincial revenues soared, and funds were poured into planned expansion of the educational, health and transportation facilities that brought Alberta into the modern era. Manning's administration was clear of corruption and, despite huge budgetary surpluses, government growth was controlled. The combination of low taxes - Alberta has been free of a sales tax except for a few months in 1936 - and efficient services, plus Manning's unchallengeable rectitude, proved politically invincible. His unease at the &QUOT;leftward&QUOT; drift of federal politics, especially after the election of Lester PEARSON's Liberals in 1963, led him to oppose several federal policies, including compulsory national medicare. He fielded his own noncompulsory, subsidized medical-care scheme, but in the end Alberta was forced to join the federal plan. Frustrated by the major parties' unwillingness to offer the voters clear-cut philosophical choices, Manning published an appeal for a reordering of Canadian politics. In Political Realignment: A Challenge to Thoughtful Canadians (1967), he called for a regrouping of forces into a social-democratic party and a &QUOT;social conservative&QUOT; party, offering a free economy plus a humanitarian concern for the truly needy. None of the parties showed much interest in this proposal. In 1968 Manning resigned as premier. He left no designated successor, and 3 years later the Social Credit government, under Premier Harry STROM, was defeated. 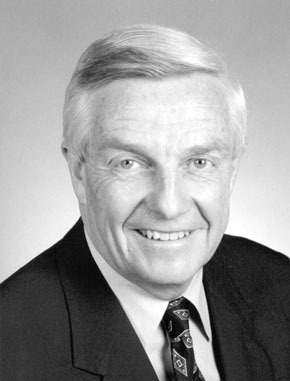 Manning was a senator 1970-83. He was given honorary degrees by several universities and was made a Companion of the Order of Canada. In 1981 he was the first recipient of the Alberta Order of Excellence, and he received the National Humanitarian Award from B'nai B'rith in 1982. He continued his weekly religious broadcasts on radio stations across Canada and the US and served as an advisor to the Reform Party, led by his son, Preston, until his death in 1996.